Kathiawari horses are from the Kathiawar Peninsula, India. 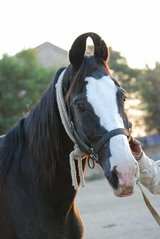 They are similar to Marwari horses and are often confused with them. Their ancestors arrived in the India via shipments made by moguls that were well known masters in the Indian lands. They have a strong Arabian horse bloodline present in them, and they certainly do look like one of the Arabian styles. The notorious Gujarat families at the time were the only ones wealthy enough to own the Kathiawari horses. While they are brave creatures and athletic as well, they are best used as a family pet. They were also once war horses but only the strong survived since only the strongest horses left after battles were typically sent to breed. Currently, you can see them being bred in the lands of the Junagadh and Gujarat families. They are bred there on farmlands, as well as working as hardy animals. They are used as riding horses, in the military, and also in polo matches. They are considered to be sporty, robust, brave, intelligent, enduring, gentle and sweet. They stand at around fifteen hands in full grown size. They have a chiseled head, curled ears, an arched neck, hard feet, and a short spine. They can be bred in chestnut, white, and virtually any color with the exception of black. They are rather muscular but still with the ability to be graceful as well. They have hard feet and are very surefooted.